GARY ANDERSON struck a magnificent nine-dart leg in his thrilling 19-17 victory over Joe Cullen in the quarter-finals of the BetVictor World Matchplay as Jeffrey de Zwaan continued his dream debut in Blackpool. An unforgettable night at the Winter Gardens saw Anderson raise the roof in the fourth leg of his tie with Cullen by landing a perfect leg, scooping a 45,000 pound bonus in the process. 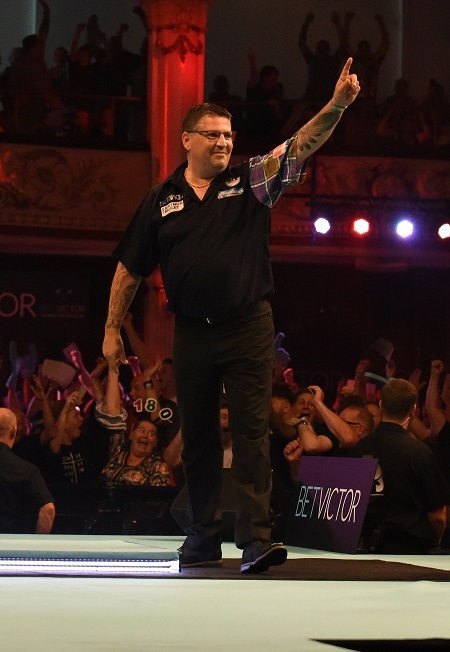 However, the Scot later had to survive two missed match darts from Cullen before winning a gripping contest in a tie-break to reach the semi-finals for the third time in five years. Anderson hit double top to stop the match going into a sudden-death 37th leg as he moved one step closer to claiming the Phil Taylor Trophy for the first time. "I fancied hitting the nine-darter tonight," revealed Anderson afterwards. "Hitting the nine-darter so early was actually the worst thing I did because it gave me time to think about it and I missed a lot more darts at tops than I normally do. "Joe played well, he's been playing well for the last few games so it's great to get the win over a top player. "Next up it's Jeffrey, who has been the player of the tournament for me. Whoever wins this tournament will have to beat him." There was never more than a leg to separate Anderson and Cullen throughout a thrilling game, with the Bradford youngster growing in belief as the tie unfolded in only his second TV quarter-final. Cullen had landed a 170 checkout as he took a 10-9 lead, and found double top with his last dart in hand to break and go 15-14 up. However, he went on to miss two match darts, at double 18 and double nine, the second of which saw a fly go across the eye-line of the Bradford star as the drama intensified. Anderson capitalised, hitting double top to level once again at 15-15 and send the game into a tie-break before the pair exchanged two holds of throw each to leave the match finely poised at 17-17. The two-time World Champion, though, found a way to win the next two legs, hitting double top once again to seal a famous win. Cullen admitted: "I'm gutted. I think the better player lost but Gary's in the next round and I'm not. Gary's a class player and good luck to him in the next round. "I was confident of hitting the double 18 and went inside, but a fly flew across right as I was throwing for double nine. I'm not saying I would have hit it, it's irrelevant now. "I'll reflect on this and I'm sure I'll find some positives." 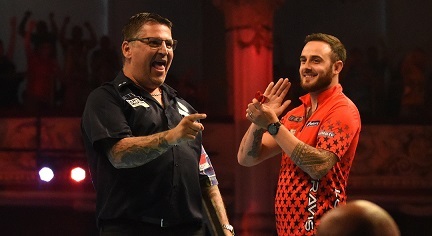 Giant-killer De Zwaan's dream Blackpool debut continued with a magnificent 16-8 win over Dave Chisnall which saw the Dutch youngster throw a 103.22 average in another impressive performance. 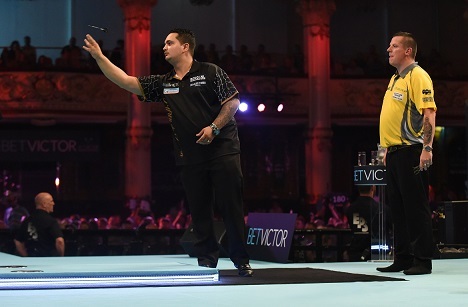 Playing in his first televised quarter-final, De Zwaan found himself trailing to five-time World Matchplay quarter-finalist Chisnall, who was averaging 115 in a brilliant start as he took a 4-2 lead before the youngster fought his way back to 5-5. The next four legs of the high quality contest saw neither player able to hold throw until, with the scores tied at 7-7, De Zwaan reeled off nine of the final ten legs to accelerate away from Chisnall and continue his memorable week in Blackpool. "I am still in dreamland," said De Zwaan, who was the lowest ranked player at the start of the tournament before defeating Michael van Gerwen and Adrian Lewis to reach the last eight. "Every game I feel more confident, I feel like I can beat anyone. This week keeps getting better and better for me. "I'm going to celebrate this win and then prepare for the rest of the tournament - I believe I can win this title."